Of all the photos I took while out at Pahranagat National Wildlife Refuge this one if my favorite. Our Meetup group, Las Vegas Photo Safaris, had finally found a place we could settle in to in order to shoot some sunset shots. 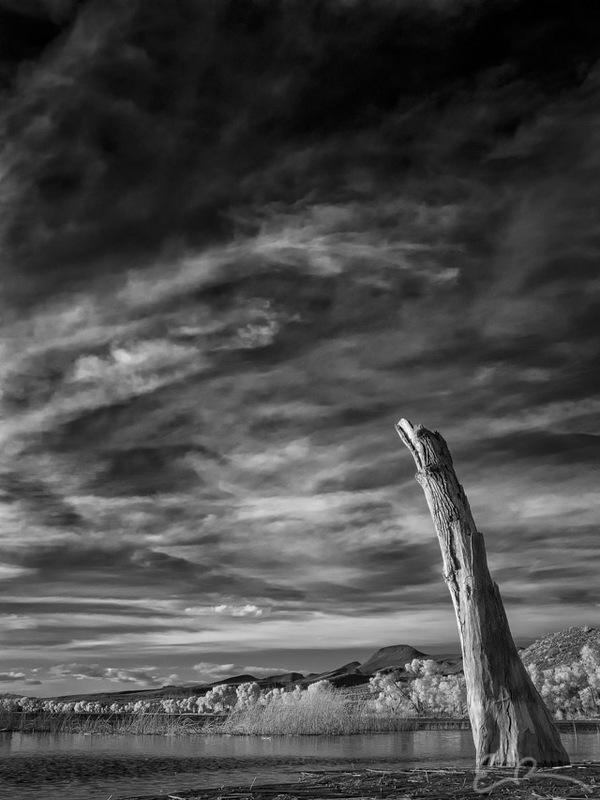 Before setting up my tripod alongside the others I decided to take a couple shots of what was left of a long dead tree. This is the final infrared photo I’ll be publishing from my converted Canon PowerShot G2. Earlier this year I found a killer deal on a new body-only 60D. I took the plunge, bought the new body, and shipped off my “old” body to be converted. I’m extremely satisfied with the results I’m getting from the new camera, but the old PowerShot has taught me some valuable lessons. The first lesson is that technology can, at times, be a crutch. For the longest time when I shot with my 60D I would constantly use live view combined with a “Rule-of-Thirds” grid overlay. Instead of looking at the scene and composing appropriately, I would obsess on the grid and the “rule”. Am I getting a foreground point on a thirds intersection? Do I have the horizon on a third? In my opinion this is one of my best photos and it was taken without a fancy grid overlay to help me compose. I had been using this grid overlay as a compositional crutch. Which leads me into my second lesson, you don’t have to follow the “rules” of photography. This photo certainly doesn’t strictly follow the “Rule-of-Thirds” for example. While the tree is only in the right third of the image it doesn’t fall on an actual third. The earth only occupies the lower sixth of the image instead of a third. So I quit worrying about the rules so much. The last thing I learned using my old PowerShot was that a “better” camera doesn’t always make “better” photos. It’s funny, I’ve read this several places, but it took learning the hard way. After getting my 60D back from conversion I was disappointed in several of my IR photos. I couldn’t figure out why I wasn’t getting the same, or better, results than I was getting before. I mean, hey I have this great new camera that is light-years ahead of that old busted PowerShot why am I not getting any good images? It wasn’t until after I learned from those first two lessons that I started to take better pictures with the 60D. Converting my 60D caused me to transfer the same flawed techniques and bad habits from my color photography to my infrared photography. Seeing what I felt was a decline in quality with the upgraded camera caused me to question if I’d made the right decision to upgrade at all. Once I’d realized I was using the live view grid overlay as a crutch to adhere to the “Rule-of-Thirds” so strictly I quit using it. When I quit using my crutch my photography started to improve. The “better” camera actually “hurt” my photography! It is funny how as humans when we’re given wisdom from another’s experience we still must learn that same wisdom through our own experiences. A parent can tell a child to not touch a hot stove because they will be burned, but the child will do it anyway. After my burns, I feel my photography is improving, and, while I don’t fear the burns that have yet to come, I’m hoping to avoid as many as possible.